How many years have you been practicing as a pharmacist? I have been practicing pharmacy for 28 years. 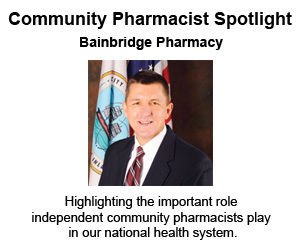 What led you to a career in independent community pharmacy? My career in independent pharmacy stems from my father. He was a pharmacist and owned Bainbridge Pharmacy before me. It was always a family business to me and I wanted to continue that. Independent Pharmacy has been an enjoyable profession for me. It provides a good opportunity to help patients with their health issues. I like the interaction I get to have with people. I also enjoy the challenge of building a business. What makes your pharmacy stand out from the competition? I believe that our service and dedication to our patients helps us stand out from the competition. Our biggest challenge at the moment is reimbursement levels, including DIR fees, claw-backs, and audits. We are not receiving enough return on our investment. Overcoming these challenges will be difficult in this current environment, with the power held by PBMs. I am trying impact the strangle hold that PBMs have by forming an independent driven PBM. Without assistance, a patient of mine would not have been able to afford her medication. I was able to work with her to obtain a copay card that allowed her to obtain her medications and continue with being compliant with her regimen. How has NCPA helped your business? NCPA impacts my business by assisting in the challenges I mentioned previously through legislative avenues and by bringing together like minded independent pharmacy owners.